Home Reviews Movie Reviews Going to a Movie: Hail Caesar! Going to a Movie: Hail Caesar! 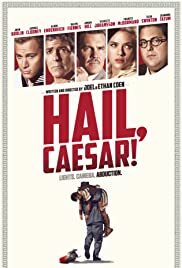 Today, I went to see Hail Caesar! on opening weekend. Crazy right? I don’t remember the last time I went to a theater for a non-superhero movie. It’s been a while. I’ve fallen out of the habit of going to the movies. Until recently, I had a nice screen with an incredible sound system. Why go to the movies? Sitting in my own comfy chairs and drinking my homebrew are certainly advantages to staying home for movies. But going out is nice, too. The theater near my house is incredible. The seat recline and rival those in my house. They’re reserved seats in an auditorium style. They serve beer. The sound system is, well, loud. Overall it’s a fun experience and worth it. So, I’m getting to the movies more this year, which is why I went to see Hail Caesar! with my wife. Did I like it? Yes, very much. There were plenty of scenes that had me laughing, including this great bit where they bring together four religious leaders to discuss whether or not the movie was going to be offensive. There was a lot more going on than a series of comedy bits, though. It was pretty clear that the Coen brothers were saying something about modern Hollywood. I mean the dig at studios owning intellectual properties and underpaying writers seemed rather on point. I’m not familiar with the workings of Hollywood these days, but I bet there’s a lot there to think about. There’s a lot of depth here, and I love that in a story. When we talk about communists helping workers and Jesus giving water to Romans and slaves alike, it’s hard to miss the parallels. Of course, it’s all wrapped up nicely in irony and humor, so we don’t have to think too hard about it. But it’s there. Comedy is really the best way to talk about faith. When it comes down to it, the most important question is: Did I have fun going to the theater for this movie?